In 2016, Swiss Re increased its focus on sexual orientation inclusion by forming a worldwide LGBT (Lesbian, Gay, Bi-sexual, Transgender) steering group. For the first time, we participated in the Workplace Pride 2016 Global Benchmarking (www.workplacepride.org) that scores international companies on their LGBT inclusion policies and practices across the globe. These insights and our close collaboration with best practice companies and LGBT associations, such as Stonewall (www.stonewall.org.uk) and OUTstanding (www.out-standing.org), are shaping our future strategy. 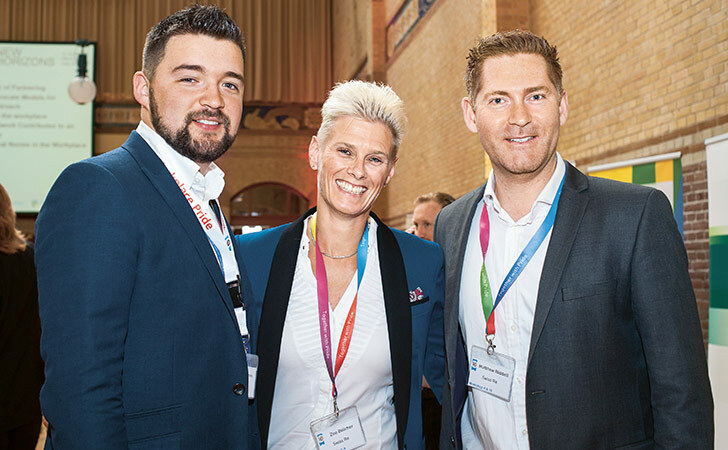 Swiss Re employees attending the Workplace Pride 2016 International Conference in Amsterdam. We have recently launched several initiatives focusing on LGBT inclusion at Swiss Re. After the very successful launch of the UK LGBT ally and network programme, Together with Pride, and building on the long-standing Swiss LGBT chapter Woolf n’Wilde, LGBT initiatives were launched in the Asia-Pacific and Americas region. Swiss Re is proud to have celebrated this year the 15-year anniversary of our Swiss Woolf n’Wilde LGBT club with members, allies and several members of our global senior leadership. As part of Together with Pride, Woolf n’Wilde is one of the first LGBT networks established in a Swiss company and acts as a local employee resource group open to everyone at Swiss Re.